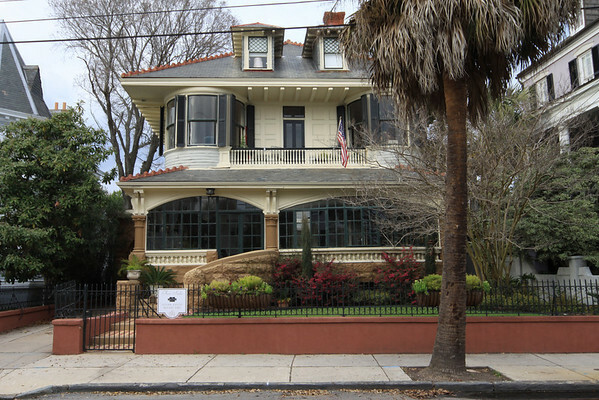 11 Cannon St., Charleston, S.C. 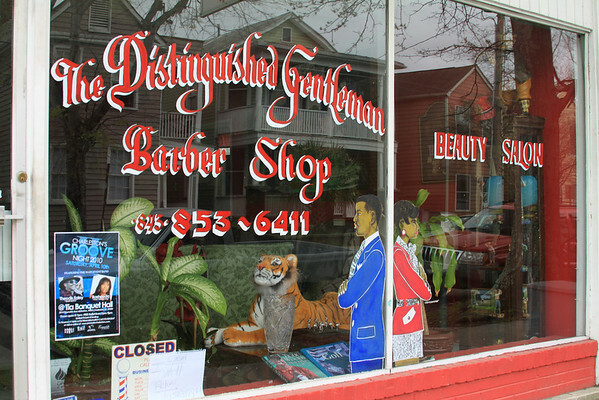 I hope we never stop having hand painted signs. The bottom one is the older shot. 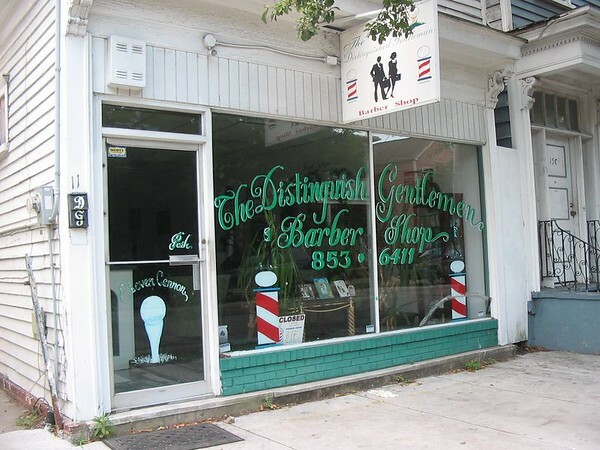 This is a little barber shop and now beauty salon on Cannon St. just off King. Absolutely charming. Wonder if there is any work for sign painters. I bet I could learn to do it as long as other folks considered imperfections part of the charm like I do. 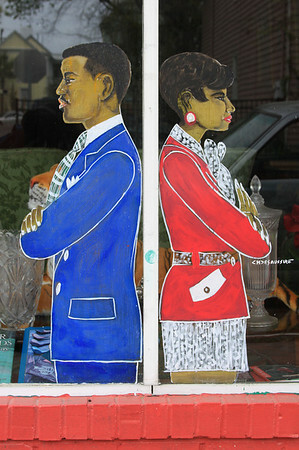 I love hand painted signs and these folks gave me a bonus with their colorful hand painted window. Does anyone know the location? Youth Service Day, 2009, Charleston, S.C.
You've probably caught on to the fact that I often serve as event photographer for non profits in the lowcountry and one happy chaos day that I usually take pictures of is the annual Youth Service Day coordinated by my friend Sally Burnett at Trident United Way. She rallies a zillion kids of all ages and lines up service projects all over town. It is an amazing production and she pulls it off with flair. This year, since it is during Volunteer Week, I have another event I am hosting and can't take care of them. Anyone else game? 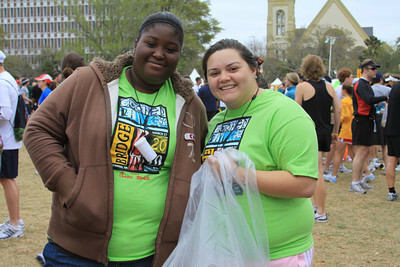 Youth Service Day is Saturday, April 24th. I usually start my day at North Charleston High School, take the pep rally and t shirt shots and then go around to as many sites as I can visit and take action shots of the kids at work. Most times they have a driver who knows where they are going. If you would be interested in helping out it would be very much appreciated. It's fun and lets you snoop inside all kinds of places you would normally have no business in (right up my alley). Your pictures will be used in United Way publications through out the year and you will come away feeling darned good about kids today. Youth Service Day: Locally, more than 600 young people participate in Tricounty Youth Service Day in Berkeley, Charleston and Dorchester counties in the South Carolina lowcountry. 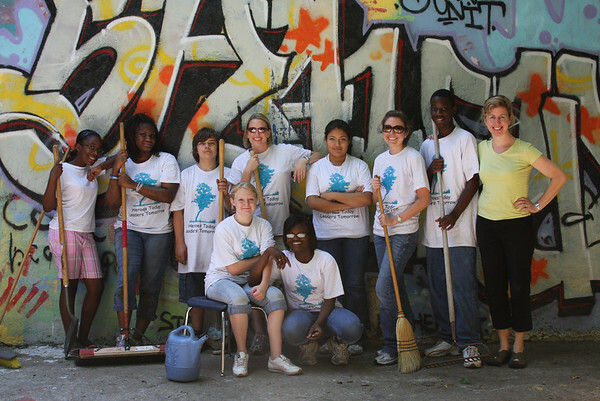 Young people can be great assets and resources to their communities, providing unique perspectives and skills while becoming better students and more productive citizens. TYSD is a great opportunity to recruit the next generation of volunteers, to educate the public about the year-round contributions of young people as community leaders, and to mobilize youth to identify, address and take ownership in the solutions to local needs through service. 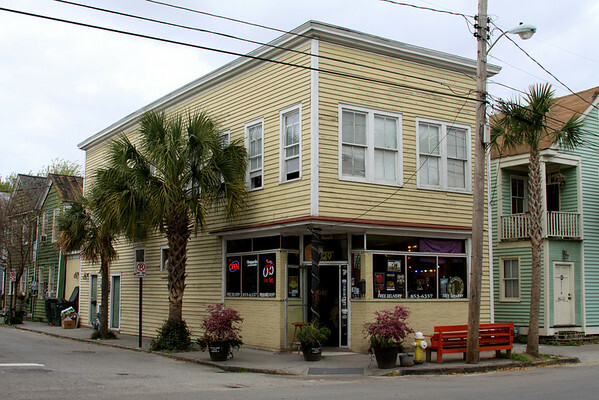 D'Allesandro's Pizza, 22p St. Philips St., Charleston, S.C.
My neighborhood Pizza restaurant. Delivered to my couch. Pepperoni, mushrooms and black olives. Yummers. Thanks guys! Do you have or know a kid who watches all the medical tv shows, dreams about working in a hospital, whose little heart would go pitter patter if they got to scrub in an operating room and play with a laparoscopy machine? If you know that kid, I want them for one week this summer. 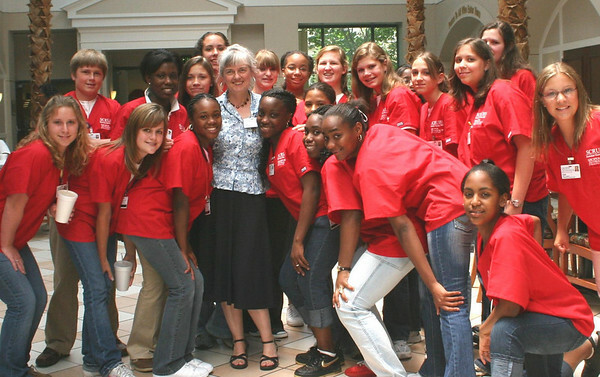 June 21st is the fourth annual award winning summer SCRUBS Camp for 13, 14 and 15 year olds. Call 402-CARE for the application packet in the morning. They will need to write a short essay on their interest in health careers and get a teacher's recommendation. This is not just a cheap summer camp, this is specifically for kids interested in health care and our hospital staff competes to give them an incredible experience. They will earn their CPR certificate, First Aid certificate, do rotations in the neonatal unit, Emergency Dept, Operating Room, Imaging and Rehab Therapy. They will do scavenger hunts and take a bus to Trident Tech to play with the simulator mannequin. Don't waste time! Last year we had 66 applications for 44 spots. The camp will be held at both Roper and Bon Secours St. Francis Hospital. I will be with the gang at St. Francis day to day and Cathy Hallman will host the Roper crew. It is safe for boys. Current groups are quite well mixed. Edit: I have more than enough applications. Thanks folks! 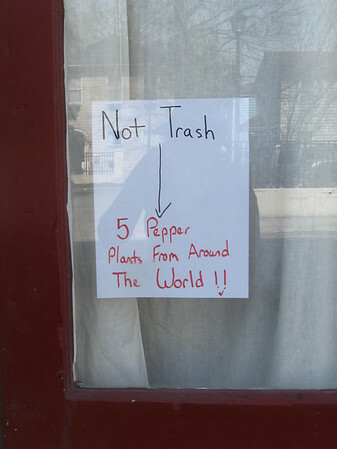 I love the casual recycling that goes on in Charleston. 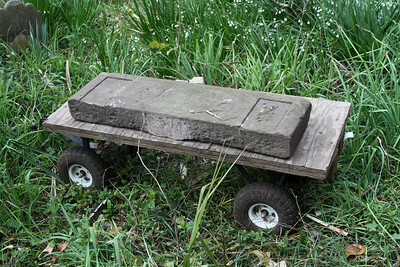 I often leave items on the curb hoping that someone will make good use of them. I peak out of the window pleased to see my belongings go off to their new home. I smiled this morning when I saw this gentleman on Bogard St. 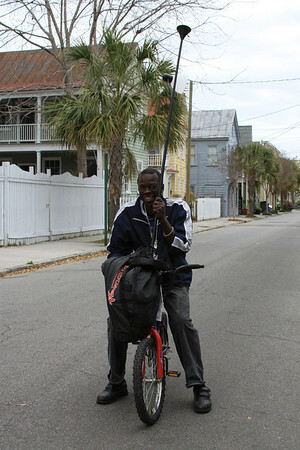 He was trying to take home a floor lamp on his bicycle. At first I was taking pictures discreetly but he caught me laughing at his balancing problem. 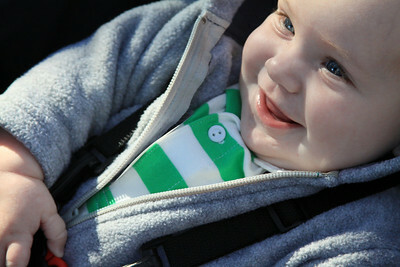 He asked what I was going to do with the pictures and I said, if it was alright with him, I'd post them this evening. 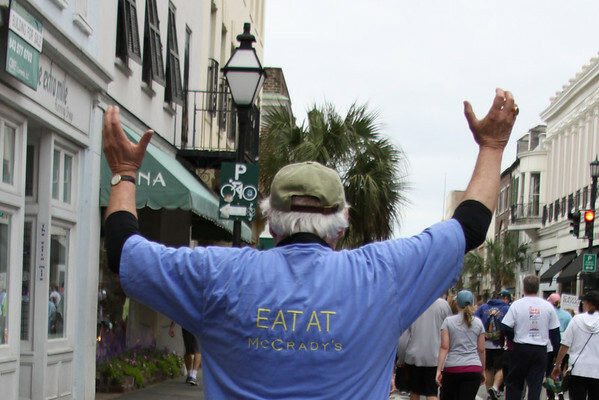 Thanks for being such a good sport Terry, you are the Charleston Daily Photo! 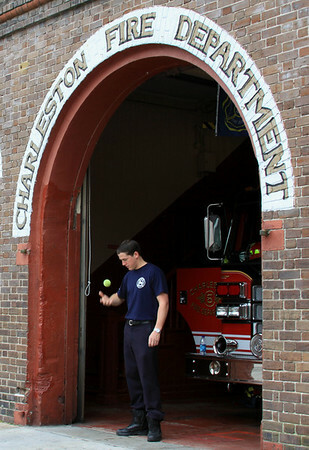 Charleston Fire Station, Cannon St., Charleston, S.C. I have a particular affection for Firefighters since I live in an ancient wood house. Years ago I walked out of my house early in the morning to find a jeep parked directly in front of my house in full flames. It was a couple feet away from my home and directly under two palm trees. Before I could catch my breath, a firetruck pulled up and in the blink of an eye, the firemen had hosed the jeep down. The car was left a pile of burned metal scrap but there wasn't a mark on my house and the overhanging trees weren't singed. Amazing. 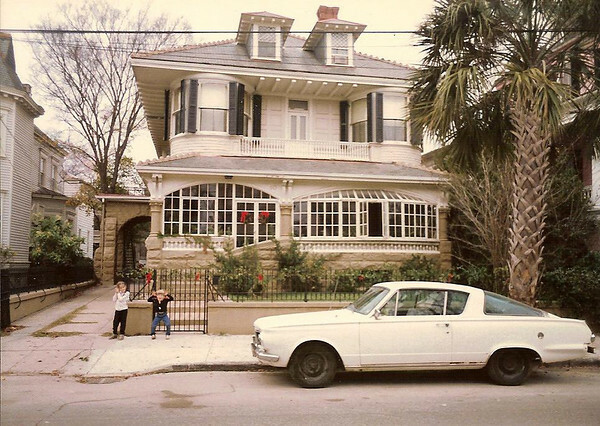 Someone did all the work for me and created a web site of Charleston's historic Firehouses. I took this picture of Alex in front of the Cannon St. Station 6 Firehouse. Charleston Historic Firehouses: Station 6, 5 Cannon Street. Built 1887-88. The third fire station built after the 1886 earthquake was a new Station 6. It replaced the former Marion Steam Fire Engine Company just down the block. Each of the three stations had a Silsby boiler on the first floor, for both heating and keeping hot water circulating at all times in the steamer. Like the Meeting Street station, this building also featured a watch tower in the rear. 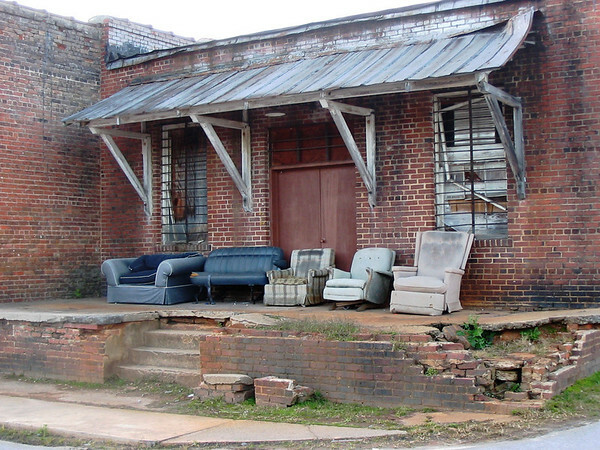 I spotted these beautiful old brick structures just this side of Columbia, S.C. Aren't they great? 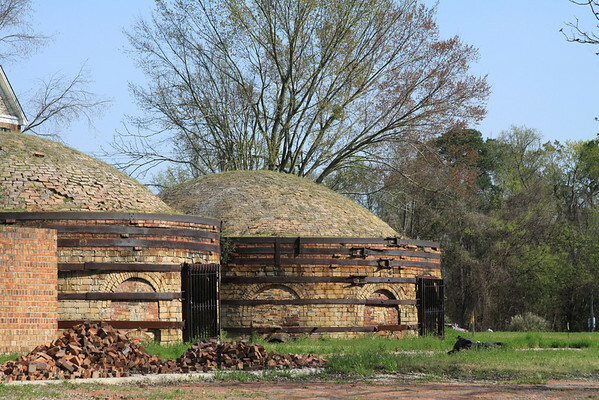 Sadly they look too far gone to be repaired but they look like they would make perfect brick yurt homes. 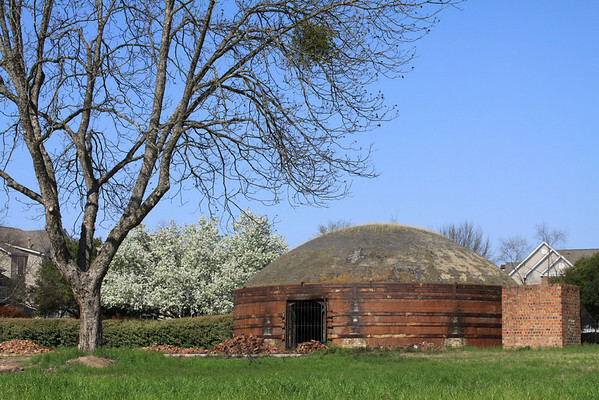 Edit: Thanks to kind comments left below, pointing me in the right direction, here is a web site with information on the structures which are kilns for the Guignard Brickyard. Photography is about trying to see things from a different angle, right? No one could figure out what I was trying to take a picture of this morning when I spotted John C. Calhoun top of a giant lemon. 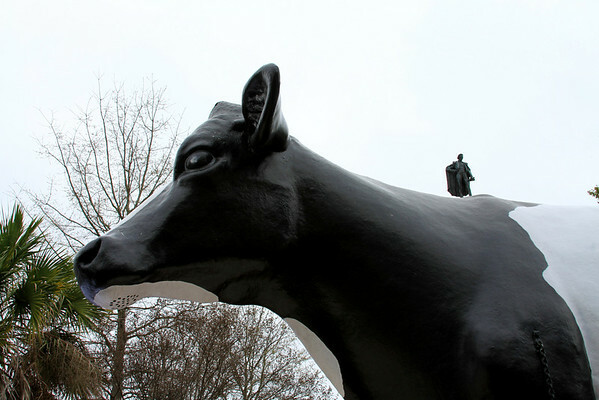 Then he turned around and rode the Chick Fil A Cow. I even have a snow dusted cloak shot. 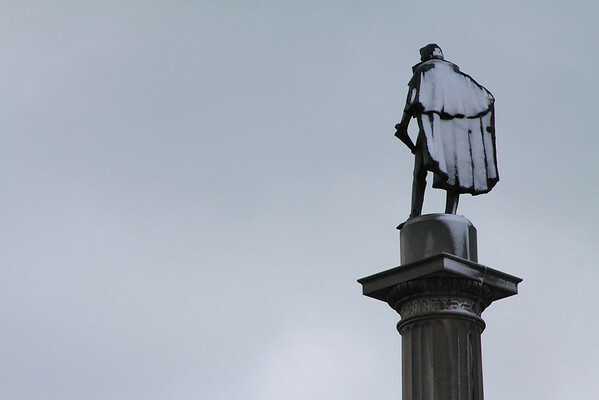 From the back, John C. Calhoun always looks like he is flashing the city to me as he stands on top of his pedestal in Marion Square. The rest of the state must be awfully quiet today. I believe every single person is here in Charleston and ran across the Cooper River this morning. 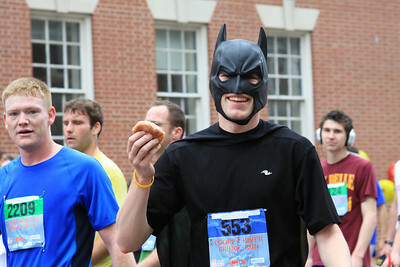 Last I heard there were 40,000 registered to walk/run. 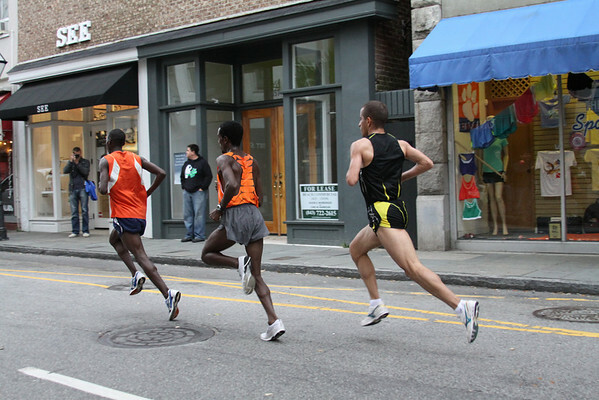 Look at the long strides on these lead runner. Amazing! Congratulations to all the participants! 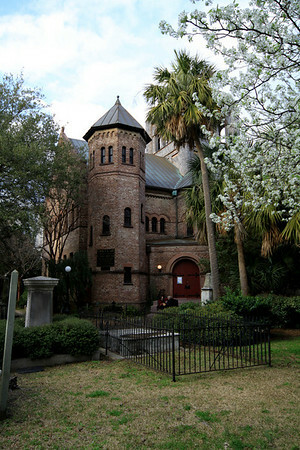 Circular Congregational Church, Meeting St., Charleston, S.C. Bonus church picture in lieu of attendance and it isn't even a Sunday. I am tossing it in for the sake of the blossoms. The blossom pictures need to be in some kind of sequence. Late night tonight hosting twenty kids interested in Pharmacy careers. There is nothing cooler than a kid eager to learn about a subject they are interested in. Don't stay up too late kids. Turn the lights out. 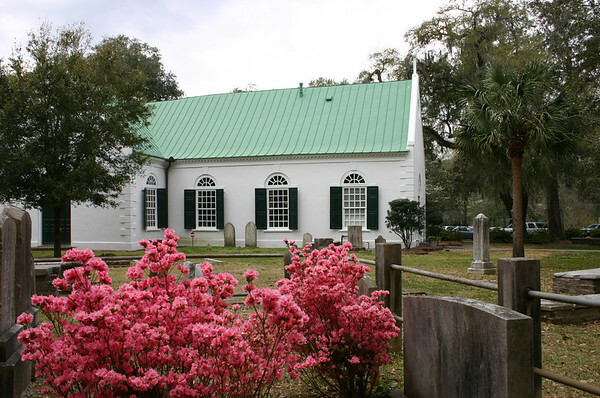 Old St. Andrew's Parish Church, Hwy 61, Charleston, S.C. It's the last week for the charming southern phenomenon that is the Old St. Andrew's Tea Room and I made it there in the nick of time. It's always like old home week. The last time I went the Red Hat Ladies swept in and took over. This year the Montessori school children all dressed up for the occasion sat at a long table in the center of the room and asked about the "mud pie". 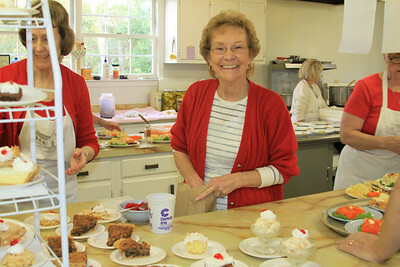 The limited menu is cooked and served by church volunteers. 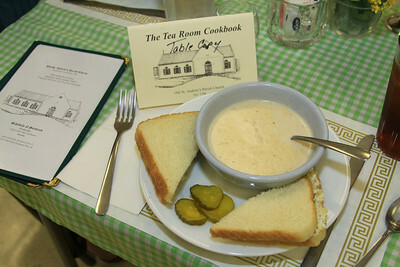 She-crab soup, chicken or shrimp paste sandwiches on white bread. Orange congealed salad and ice tea. It used to be that you had to whisper to the server dressed in historic dress that you'd like a piece of Miss Arlene's coconut cake set aside for you, but now they just put it on the menu. Augusta Nadol (above) is one of my hospital volunteers as well and she told us they served 222 lunches yesterday. Amazing. History: In the late 1940's, shortly after the church was reopened, a group of women often spent all day cleaning and preparing the church for worship services. They had their lunch on the lawn, and soon began to share their lunches with tourists who stopped to see the old church. Because there were no restaurants in the area at that time, and as a way of raising funds for renovation, the ladies began selling coffee, lemonade, and sandwiches to tourists. Thus the Saint Andrew's Tea Room was born. 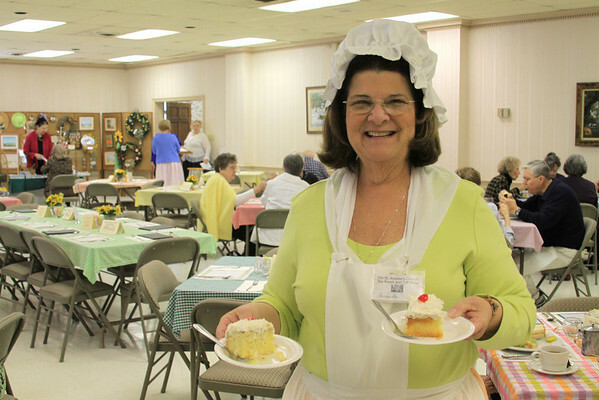 Today waitresses are dressed in late 18th century costumes and serve a full lunch in the Parish Hall. A full gift shop is available and tours of the historic church are available. 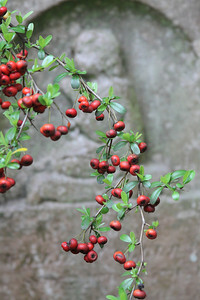 * I took the tea room photos today but slid in a church picture from last year. The azaleas aren't quite in bloom yet. 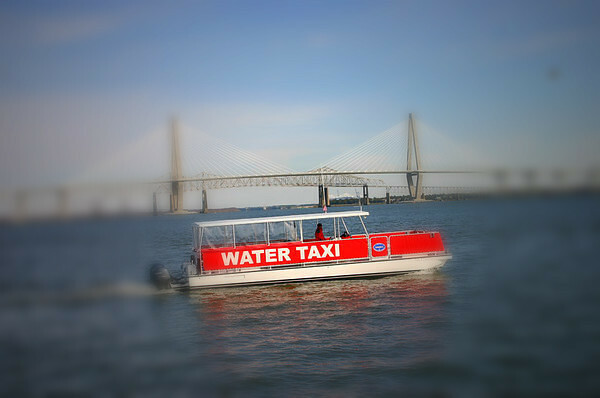 Water Taxi, Charleston Harbor, Charleston, S.C. 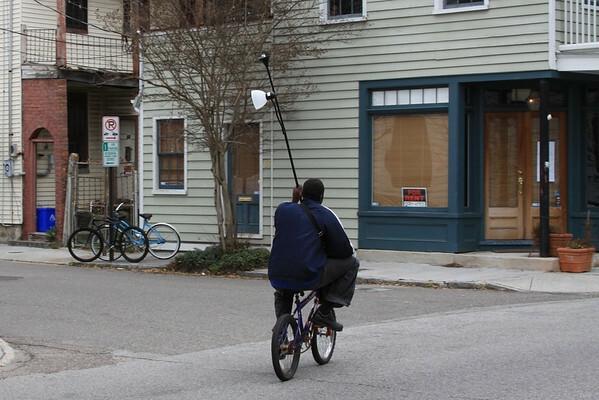 I love the Tiny Charleston tilt shift blog. It makes me feel like we live in a doll house world. Here is how you cheat and make your own tilt shift photos: tilt shift generator. Let me know if you post one. I'll want to check it out. I loved this picture. I'd picture the seats full of a cast of characters, sitting in the shade enjoying a smoke, a cold drink and catching up on the local gossip. It was taken in the tiny town of Pomaria, S.C. It's gone now and I can tell that by zooming in on google maps. Here is the exact location on Victoria Street. Amazing. 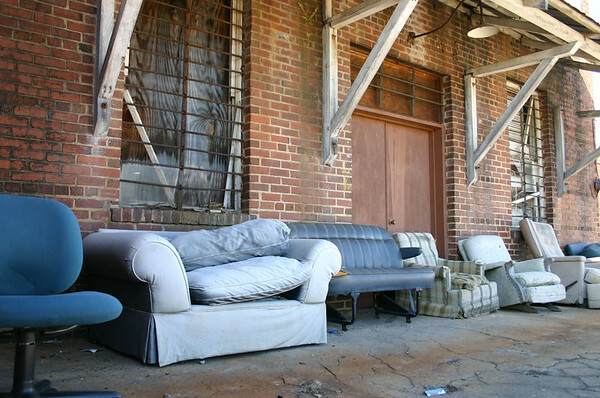 My street in Charleston isn't on google street view but the back view of the abandoned buildings of Pomaria is. 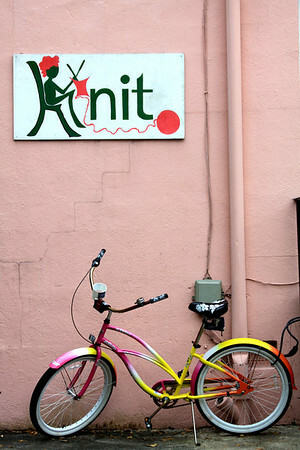 KNIT, Coming St., Charleston, S.C. 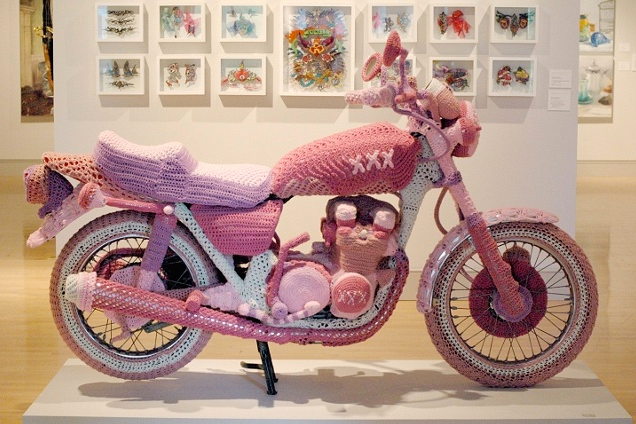 I spotted this colorful bike behind the Knit Yarn Shop on Wentworth St.
Now check out this luverly knitted bike on the Book of Joe - the world's most popular blogging anesthesiologist. 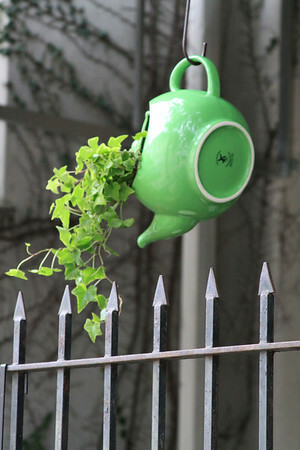 I do so love creatively wacky people! I am off! Have yourself a merry little day. In this case it isn't a Before & After since the building is under wraps right now. I'll have to take the picture again after the unveiling. I often steer my walk back home through the campus because it is such a beautiful spot. 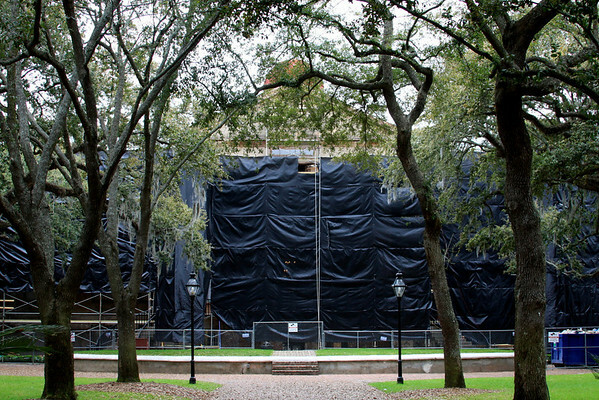 Surely they will have it finished for the Spoleto Festival concerts at the cistern. I detoured to pick up my favorite salad from Five Loaves Cafe on Canon St. for dinner. Yum. You have to try the: Tomato, mozzarella, roasted sweet peppers, asparagus and baby greens with the wild mushroom and soy dressing. Bogard St. if I recall correctly. I stopped by Horizon Bay Assisted Living (behind West Ashley Home Depot) to visit an old buddy on the way home. Then I kept seeing names of folks I knew on doors, knocking and visiting a while. I tried to tell them as much wicked gossip as I could think of. Nice little suites, they clean, wash your linens, take you to the movies. I may move in. 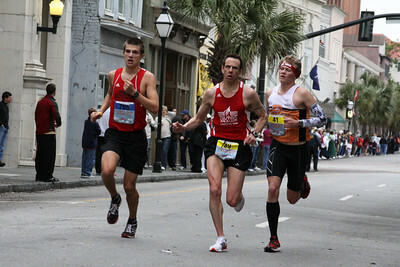 I am on the run, kids...so I'll keep you busy with a link I just found to another Charleston based blog. Go pay a visit to Everyday Musings. So much good stuff I come across. 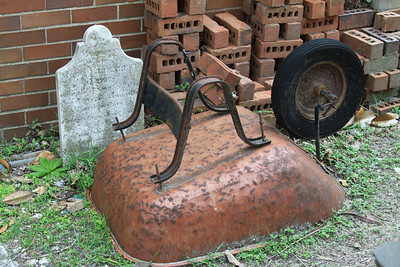 I'm thinking it might be time to resurrect the old "blogger meet-up" and get together. We used to have them regularly and then got distracted by so many lowcountry bloggers finding new homes in Twitterland and Facebook. Let me know if any of you want to help plan one for current bloggers. 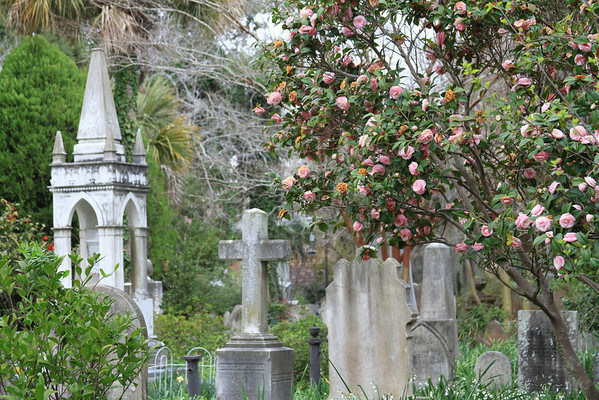 Unitarian Cemetery, Archdale St., Charleston, S.C. I walked this morning through the old Unitarian Cemetery on Archdale St. just before the rain started. 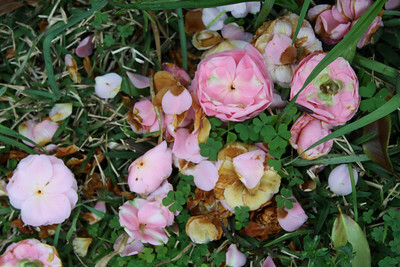 The camellias are in their glory and I love the browning petals on the ground as much as the rare perfect bloom. 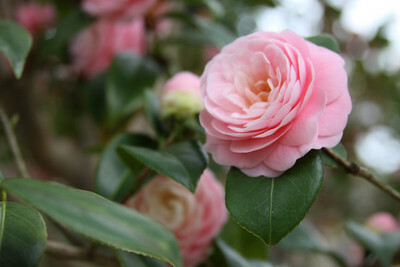 I think I may need to get some camellia bushes for myself. All I have is one white bush. 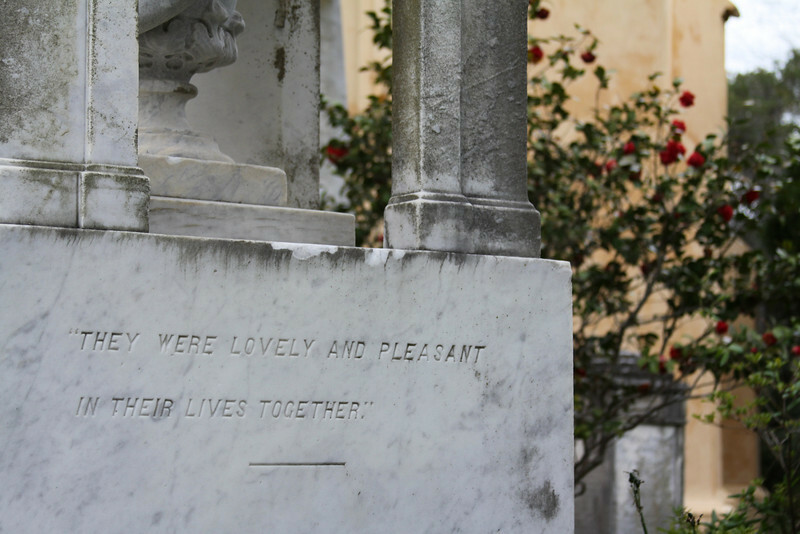 I love the saying on this tombstone. It makes me hope the couple had a long and happy marriage. I hope everyone has had a good weekend. According to my tradition I have left all my chores to do in the last few hours. Blah. Anyone want to come over and do my taxes for me? For Waldo...who collects all my joggling board pictures. I say, "Oo." You say, "long." Fuchsia Tea Emporium, Church St., Charleston, S.C. If you drink tea you MUST watch this video. 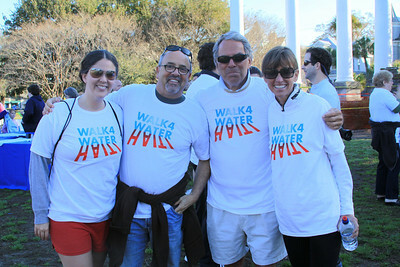 Walk for Water - 2010, Charleston, S.C. 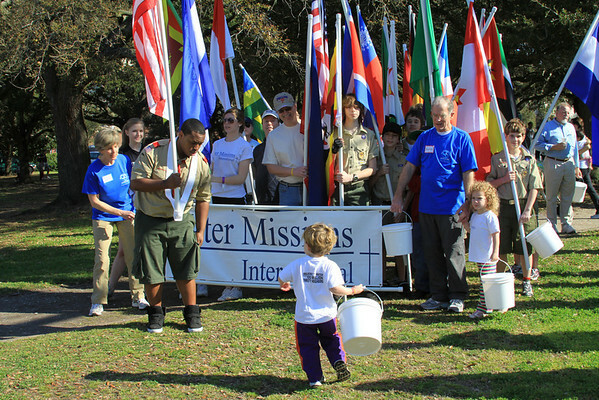 If you've dropped by here more than a few times you know that I am a strong supporter of Water Missions International. I love, love, love the practical solution they came up with to purify water. Last year the health system I work for raised funds to build a water purification system for a little hospital in Kenya and I was lucky enough to go to document the trip. Production at the WMI warehouse kicked into high gear after the earthquake in Haiti. We raised funds and sent over lunch for the hands-on volunteers. Today was their annual fund raising walk and I went by to show my support. The Rehab Dept. 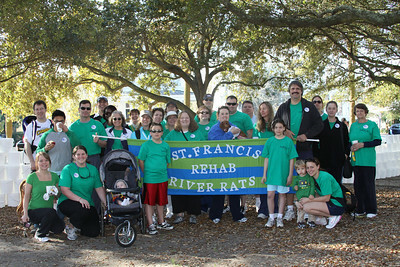 at Bon Secours St. Francis Hospital rallied almost all of their department for the cause and called their team the "St. Francis River Rats". 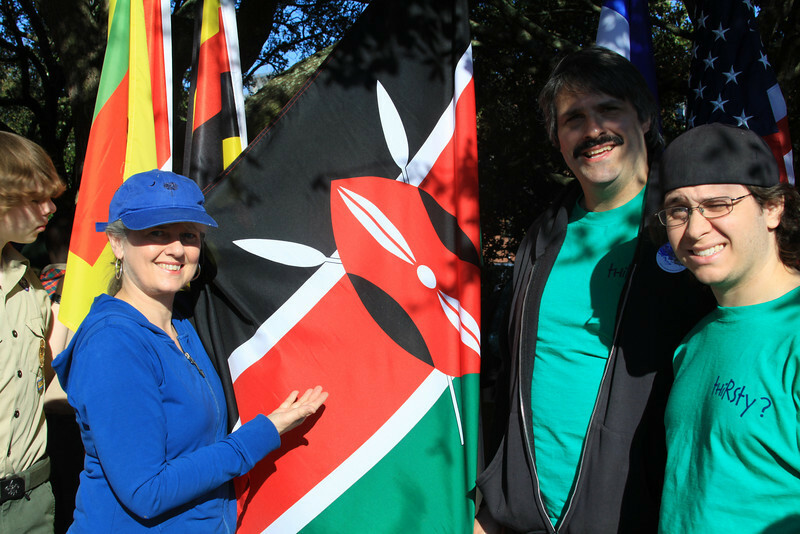 I was tickled that we were invited to carry the flag for Kenya because of our continuing involvement there. The three mile walk was led by founders Molly and George Greene (our heroes wearing blue above) and their family, started at Canon Park, marched down to the Battery, circled White Point Gardens and back. 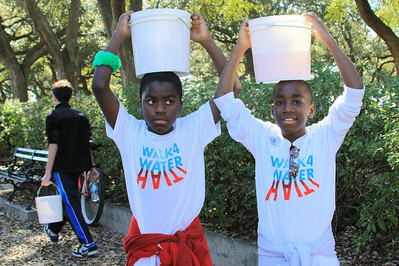 Along the way walkers were encouraged to fill their bucket with water to get an idea of how most of the world gets their water. Thanks to Caroline Nuttall from Charlie and Micky Bakst from Charleston Grill (bottom photo, left) who coordinated a large team of supporters and fundraisers. It was a beautiful day and a wonderful thing to be part of. More photos here. 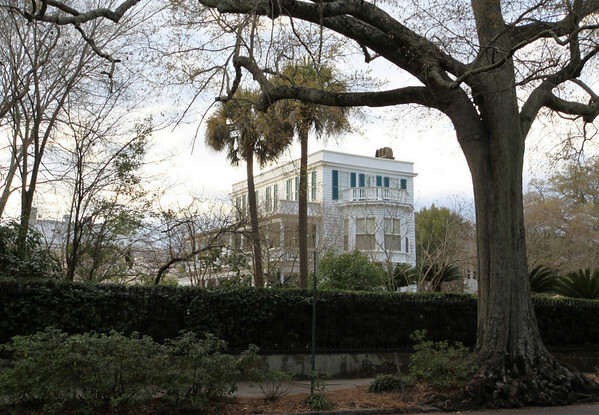 50 South Battery, Charleston, S.C.
We rented the little kitchen house behind this beautiful home the first year I lived in Charleston and my kids played at White Point Gardens every day. The elderly lady who owned the house had lovely plants on that glassed-in porch and her granddaughter was delighted to have kids on the property to play with when she visited. It has been spruced up and is subdivided into expensive condos now. 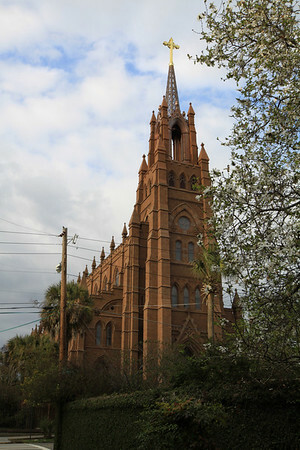 Cathedral St. John the Baptist, Broad st., Charleston, S.C. There should be laws against cool things being deliberately scheduled during my work day. Last week cranes lifted a giant cross up off the ground and dropped it down to create this steeple. You'd think if the church went without a steeple for a century they could have waited until I was there with my camera. Luckily the church web site has the video. What a grand sight! 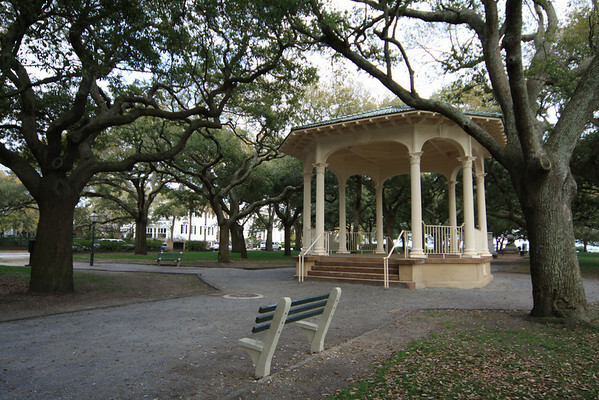 Bandstand, White Point Gardens, Charleston, S.C. 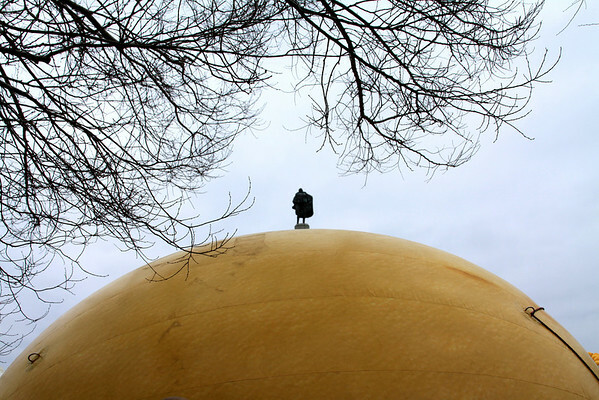 I am behind in bringing you the changes in the Holy City this winter but daylight savings time will take care of that. I walked a big loop of the peninsula this evening and still made it home before dark. 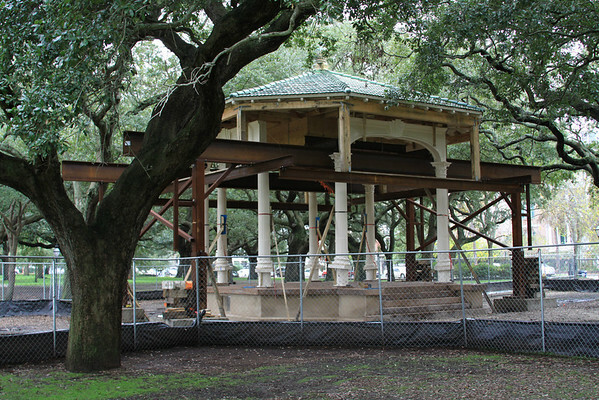 The White Point Garden bandstand renovations are complete and she is a sweetie! 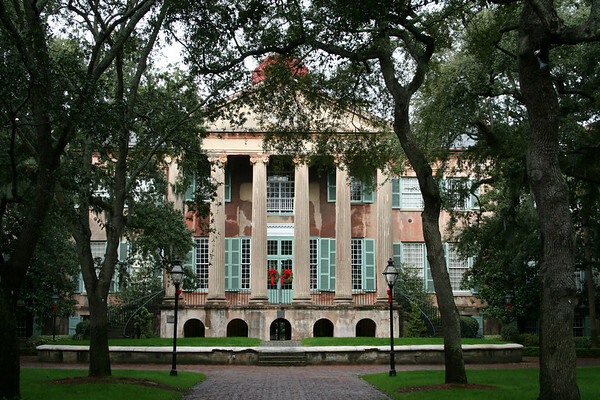 Paint Charleston Daily followed the progress and detailed construction. The Post & Courier reports that it could actually be used for bands again. Interested in getting married in the shiny new bandstand? Premiere Charleston has the scoop: You can reserve the gazebo for a nominal fee – as little as $100 – for a party of up to 25 people. 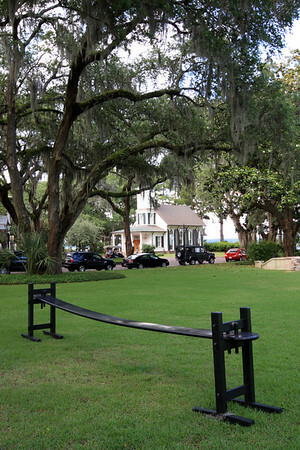 To reserve, contact the City of Charleston Recreation Department at (843) 724-7327.